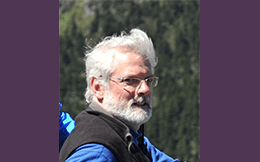 Dr. Werner Kurz is a Senior Research Scientist at the Canadian Forest Service (Natural Resources Canada) in Victoria, BC. He leads the development of Canada’s National Forest Carbon Monitoring, Accounting and Reporting System and the Forest Carbon Management Project of the Pacific Institute for Climate Solutions. His research focuses on carbon dynamics in forests and harvested wood products and the opportunities of the forest sector to contribute to climate change mitigation. Dr. Kurz co-authored eight reports of the Intergovernmental Panel on Climate Change (IPCC) and published over 135 peer-reviewed scientific papers. He is an International Fellow of the Royal Swedish Academy of Agriculture and Forestry. The Science-Stakeholder Dialogue will stimulate exchange of scientific knowledge and the stakeholders’ perspective on climate. The dialogue will be introduced by a Science Keynote by Werner Kurz, reporting back from the scientific sessions followed by a discussion with five panelists from policy, industry and CSOs.